Similar water tank on the port side is used to cool the Generator engine. On the 28/05/2018, they were only 1117 hours on the main engine. Built in 2009 by LEDGARD BRIDGE BOATS Limited, Cat D Broad Beam Barge which has none-the-less crossed the Chanel under its own steam. Dimensions allow access to virtually all French waterways, including the Nivernais without removing the wheelhouse. 2 doors access on the aft deck and 2 side doors direct to the galley/wheelhouse. Access to the forward deck by side decks and also by the forward cabin window. Bow thruster and its battery is located under the foredeck and accessible by the hatches. The engine room is located under the huge aft terrace, 2 water tanks to cool the engines (main engine and generator). Also, 3 air con units, and a very accessible weed hatch for the props. All the other equipments and tanks are located under the floor of the galley, and in the cupboard of the main forward cabin for the shower pump. All main electric panels are located under the helm. Fully insulated boat (see photo) by spray foam. Original documentation and several folders available on board. Access to the vast aft deck terrace all covered with adjustable covers. One step down to the open galley-wheelhouse, helm on the port side and galley on the starboard side. A diesel burner range cooker (2 hobs and 4 ovens) serves as cooking, roasting baking and also heating the domestic hot water and all radiators. well equipped galley (dishwasher, washing machine, fridge, freezer, also a small collapsable TV screen in the corner of the galley. All the boat is heated by radiators except the forward cabin heated by hot blown air. All the windows are equipped with blinds and curtains. Helm position with adjustable steps to accommodate the size of the pilot. Two steps down, a comfortable double bunk berths with office desk on port side and opposite, a shower room with heads and basin. All in one level form now to the bright and cosy saloon. Two confortable adjustable chairs, a huge TV screen, and dvd player, 4 HIFI speakers (one in each corner of the lounge), and curtains and blinds on all windows and hatches. TV is possible thanks to an automatic antenna dome on the deck. Forward is the master cabin, with central bed and ensuite shower room with Italian walk in shower, heads and sink. Draws under bed and plenty of cupboard spaces. Bright interior with wood panels and floors, wood furniture and quality finish giving a cosy aspect of the all boat. Heating: hot water by the diesel Range cooker through all the radiators , and hot blown air for the master cabin. Aircon. Three water cooled reverse cycle air conditioning compressors providing A/C and auxiliary heating throughout. All the electric equipment, tv screens and furnitures are includes in the sale, with the exception of all the paintings and the lamps in the lounge. Headroom in the boat is between 1.98m and 2m. Barge for sale in France. Boatshed Bourgogne is happy to offer this wide beam barge, built in 2009 by the well respected LEDGARD BRIDGE BOAT yard, a great example of a well executed live aboard barge with quality and very well maintained by our vendors during this last 9 years. Suitable for the broads but very comfortable on the French waterways, even the Nivernais. Technically well designed, all electric up to high standard. All the schemes and plans are available, and builder specifications too. Comfortable for 2 with occasional guests, less than 20 m with a width of 4 meters allowing to have a spacious interior. 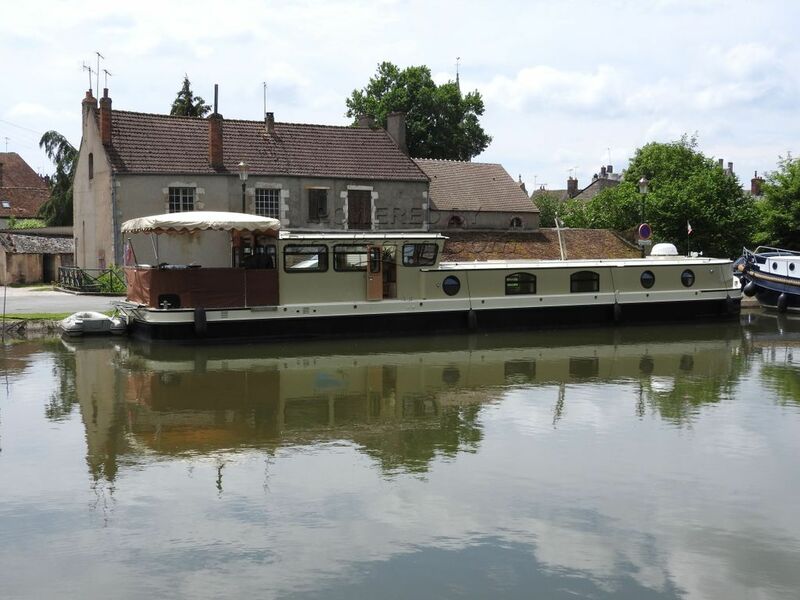 I was pretty impressed by this barge, all the quality of the equipments, a bright modern and cosy interior suitable for all year long life, and a stylish Range cooker so unusual in France. Everything seems new not 10 years old. A great aft deck to entertain and so few steps that this is almost a Sedan boat. This Wide Beam Barge has been personally photographed and viewed by Cathy BOUGUEREAU of Boatshed Bourgogne. Click here for contact details.